Obviously, with all these castles in a relatively short stretch of river, most were not inhabited by Germany’s royalty. They were the “estates” of robber barons, who built these fortresses as armored bunkers – to protect from all the pissed-off poor folk who might try to steal a bit of their wealth, since, shockingly, there was no 911 in medieval Europe. 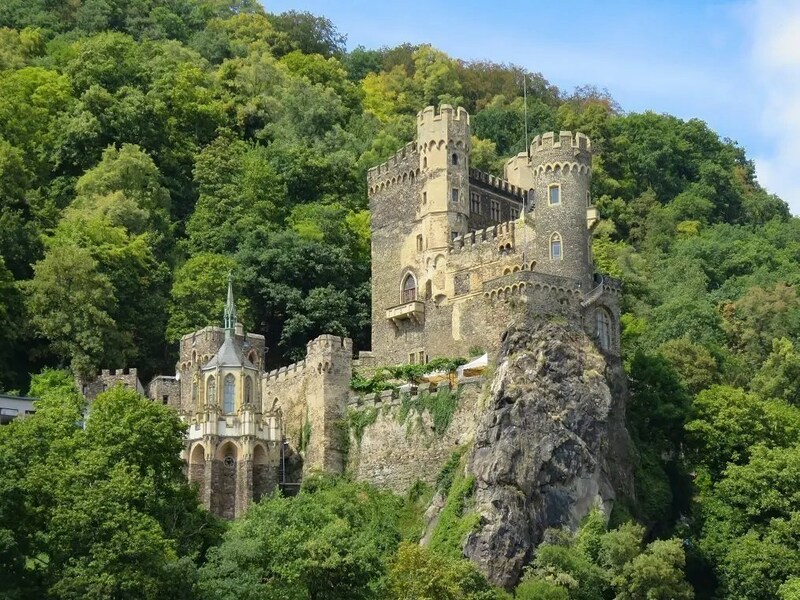 In the late 1800’s, as Germany formed into a state, they began to restore and protect these castles in order to create tourism; and indeed, today, the castles are managed by a state commission. Any modern buildings in the charming towns that dot the landscape are kept out of sight from the river view, so all you see is charm with a capital C.
Have a camera with a reasonably good zoom lens. Actual cameras work best, since the zoom lenses on phones are not great quality thanks to the slimness of the phone body. If you don’t like lugging a real camera around, you can also consider buying a small, inexpensive snap-on zoom lens for your phone. Make sure whatever camera you have has freshly charged batteries. You’ll take a LOT of photos. Obviously, you can watch and photograph the passing castles while wearing your onesie with the bunny tail in your cabin, but if you go up to the top deck, you’ll have a view of both sides of the river, which is key to catching all of them. The better river cruise lines will have entertainment and/or serve lunch on the top deck during this stretch of cruising, so you don’t have to miss a moment. There is no other stretch of European river quite so scenic as the Middle Rhine. If you don’t go with Brand g, be sure to check with your cruise line before booking to ensure that they do a daytime cruise of this magical valley. It’s a can’t-miss moment!